Stef Loy and Nick Spruit met years ago at a temp job at the Grand Rapids Press, working in Walker, MI third shift. After years of knowing each other, they began to write music, and after creating several CDs, they finally put a band together to perform live. In the fall of 2016 Lapdogs officially formed, and their first full-band CD “You Live There” was released last May. The band plays around town at places like Rocky’s Bar and Quinn & Tuite’s Irish Pub, and are currently excited to be playing Grand Rapids Festival of the Arts on Friday June 2 @ 4:45 pm (Kendall Stage). 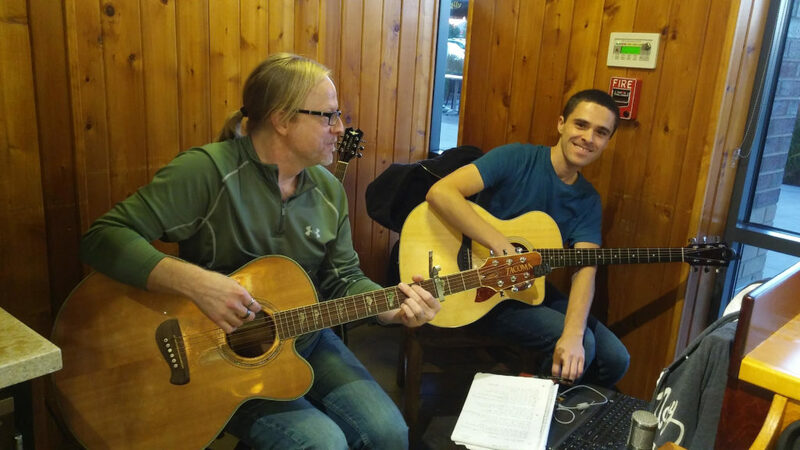 Stef and Nick continue playing un-plugged together at Potbelly’s in Grandville on a bi-weekly basis, at various open mic nights, cafes, and farmers markets all around West Michigan. There are talks of the two doing a quieter un-plugged CD as 2DOG by the end of the year.